Kenneth J. Peltz’s new book, Desperate People Desperate Prayers - A Journey Through Old Testament Prayers, ($18.99, paperback, 9781498474849; $9.99, e-book, 9781498474856) is an assemblage of words spoken to God – supplication sent out to Him to give thanks, ask for mercy, seek direction, or show praise. Supplemented with thoughtful explanation and commentary on their significance, each prayer is broken down into a perfect introduction to the Old Testament. The author believes that many Christians consider the Old Testament too troubling, too outdated, or too angry to warrant the time needed to wade through and understand its depth. If so, Kenneth J. Peltz solved that concern by compiling the prayers of the Old Testament in a unique, refreshing and interesting way, to demonstrate how God’s message is steadfast. This book is truly a welcome invitation to explore the rich history of the Old Testament – a keen look into the very foundation of God’s Word. Perfect as an accompaniment to a Bible study, a resource for sermon writing, or a reference for personal edification, this book will enlighten readers on a journey to know Him through His Word. Kenneth J. Peltz is now retired after practicing 40 years as a Real Estate Broker in Southern California. He is the proud father of two daughters and three granddaughters. He has been a dedicated student of the Bible for approximately 20 years under the pastorate of Pastor Emeritus Jack Hayford, founder of The Church On The Way in Van Nuys, California. Kenneth is also a student of the original King’s Institute at The Church On The Way. Xulon Press, a division of Salem Media Group, is the world’s largest Christian self-publisher, with more than 15,000 titles published to date. 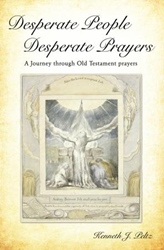 Retailers may order Desperate People Desperate Prayers - A Journey Through Old Testament Prayers through Ingram Book Company and/or Spring Arbor Book Distributors. The book is available online through xulonpress.com/bookstore, amazon.com, and barnesandnoble.com.